Three Cheese Squash Casserole with Poppyseed Ritz topping gets huge flavor from three cheeses and a crunchy, buttery crumb topping. It can also be made ahead! After years of experimenting with squash casserole, this version is my hands down favorite. No egg, mayo, or canned anything in this recipe. The squash and onions are simmered in seasonings and mixed with cheeses, sour cream & butter. The buttery, poppyseed-laced Ritz cracker topping takes this over the top. 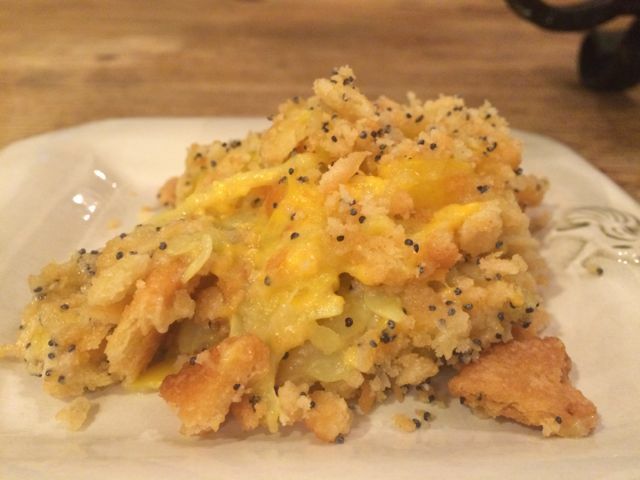 Here are a few of the tweaks that make this squash casserole exceptionally yummy. The squash is simmered with fresh onion in a seasoned broth. I usually use water and add a couple cubes of chicken bouillon, sea salt & ground pepper. I try to cook the squash until “just tender” and with a bit of heft to support the cheeses and other additions. (Before I knew better, I boiled my squash into oblivion.) Note: Squash can also be steamed or sautÃ©ed until tender. Using a combination of 3 cheeses~white cheddar, yellow cheddar, and Parmesan~adds interest and depth of flavor to the casserole. Sharp cheddars also add more punch than mild or medium versions. Poppy seeds add a hint of texture and slightly nutty kick to the crumb topping. Make ahead method: If you want to make this ahead of time, it is super easy. Just make the casserole up to the point of topping. Keep in the fridge for up to 24 hours. Remove from fridge at least 30 minutes before baking, add the crumb topping, and bake as directed. I hope your family loves this recipe as much as mine does. Thanks so much for stopping by my site. As always, be blessed, and stay savvy! 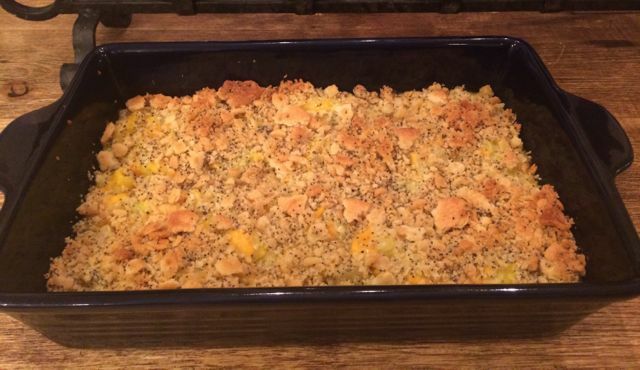 This is the best squash casserole ever and can be made up to a day in advance. In large saucepan, put squash and onions. Cover with water. Add 2-3 bouillon cubes, salt & pepper. 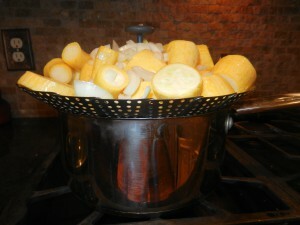 Bring to boil; reduce to simmer and cook until squash pierces easily with fork (but is not mushy). Place squash in bowl; season with salt, pepper, and the melted butter. Add sour cream and cheeses; stir until well combined. Spread squash mixture in bottom of casserole dish sprayed with cooking spray. If making ahead, do not add topping; refrigerate casserole for up to 24 hours. Before baking, remove from refrigerator; let stand 30 minutes. Mix all topping ingredients; sprinkle on top of casserole.